These images are of the 2011 Kia Sportage SUV, revealed via Kia’s patent filing with the EU Patent Office. It shows either the production version or as some suggest, the near production concept that could be paraded at the upcoming Geneva or Seoul motor shows. 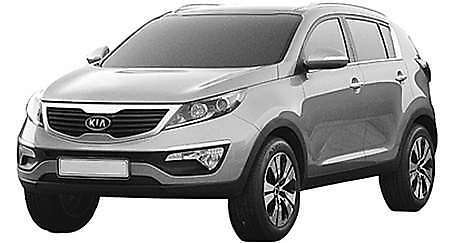 The Sportage is scheduled to hit domestic showrooms towards the end of 2010 or by the first quarter of 2011. Penned by former Audi designer Peter Schreyer, the mid-sized SUV features Kia’s new signature grille and sports a cleaner, less severe look than the Hyundai Tucson/ix35, which it shares underpinnings with. The Hyundai was introduced in Singapore last November with a 166 bhp/197 Nm 2.0-litre Theta II engine paired with a newly developed six-speed automatic, so we presume that the Sportage could carry the same drivetrain when it reaches our region.